Virtuosi di Kuhmo was founded in 1992 to continue the traditions of the Kuhmo Chamber Music Festival's orchestra. At present, Virtuosi di Kuhmo is an independent ensemble with its own organization and artistic planning. Orchestra members range from musicians in top-rated Finnish orchestras to artists pursuing international careers. Besides being a regular performer at the leading Finnish music festivals, Virtuosi di Kuhmo has also toured extensively; in addition to the largest countries in Europe, the orchestra has given performances in Russia and Japan. London's Wigmore Hall and Concertgebouw in Amsterdam are among the more renowned concert halls the orchestra has visited. 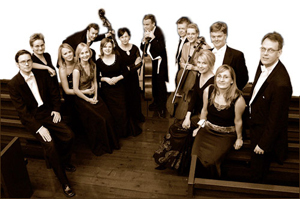 Virtuosi di Kuhmo has also performed at well-known international festivals such as Festival Pablo Casals, La Roque d'Anthéron, La Folle Journée and Rheingau Music Festival. In the summer of 2005, concerts at the Kuhmo Chamber Music Festival and Crusell Week in Uusikaupunki were broadcast in several European countries. Violinist-conductor Peter Csaba has been Virtuosi di Kuhmo's focal artistic collaborator from the beginning. Founder of the orchestra, he has conducted most of Virtuosi di Kuhmo's concerts and recordings. In addition to Peter Csaba and Ralf Gothóni, Virtuosi di Kuhmo has been conducted by, among others, Olli Mustonen, Sakari Oramo, Hansjörg Schellenberger, John Storgårds and Okko Kamu. During the years, Virtuosi di Kuhmo has worked with several renowned artists, such as Lisa Batiashvili, James Crabb, Nelson Freire, Martin Fröst, Bruno Giuranna, Natalia Gutman, Aleksei Lyubimov, Vladimir Mendelssohn, Daniel Müller-Schott and Pieter Wispelwey. Virtuosi di Kuhmo's recordings have all received critical acclaim in both the national and international press, including 'Record of the Month' in British magazines and American radio stations. The recording of Vivaldi's Four Seasons featuring Pekka Kuusisto (ODE 939-2) reached gold album status in Finland.